In addition to the main church with the Icon of the Virgin Mary, our tour will include the baptism rooms; the site of the actual discovery of the Icon; the memorial to the Elli sailors who lost their lives when their ship was torpedoed in Tinos harbor in 1940; the museum of Tinian Artists; the museum of Gifts; and the Art Gallery with original works of famous Greek painters. A walk through the town will also highlight the architectural changes, from Venetian to Cycladic to Modern, and back again in reverse to the present revival of the Venetian style. 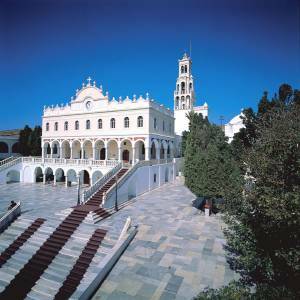 The tour will also include a visit to the Archaeological Museum of Tinos, with finds dating back to the 5th Century BC. And, finally, no tour would be complete without a tour of the main shopping district, with tips on what to buy and where to find the best prices. Notes: Groups Only or as a Private Tour. Suitable modest attire required for the visit to the Church of the Panagia.